Join us Wednesday at Calvary for Fellowship Dinner in Fellowship Hall from 5:00-6:15. We have two Bible studies: “You’ll Get Through This” led by Carol Davis & Carrie Beth Tonks and the women’s Bible study “Church of the Small Things” in Rachel’s Room (no book or sign up needed). Worship with us on Easter Sunday at 7:00 (Sunrise Service on the Green Space), 8:30 or 11:00. Hank Ellington will share his sermon “What’s Love Got To Do With It?” at Sunrise Service. Bob Browning will share the message, “An Empty Tomb Filled With Hope” at the 8:30 & 11:00 services. The Scripture reading this week is from John 20:1-18. The 11:00 worship bulletin can be found here. All who attend the 7:00am service or 8:30am service are invited to join us for breakfast from 7:45 - 8:15am in the Fireside Room. On Sunday, May 5 at both 8:30 and 11:00 Services we will be collecting an Offering For Global Missions in partnership with Cooperative Baptist Fellowship. One hundred percent of your gift to the offering goes to missions funding and sends CBF field personnel to share the Good News of Jesus Christ around the world. Please visit the CBF website for more information on the important work happening with the help of the Offering For Global Missions or contact Brian Varble. “In the Garden” by Susan Scott 4/17/19- click HERE to read this week’s devotion. 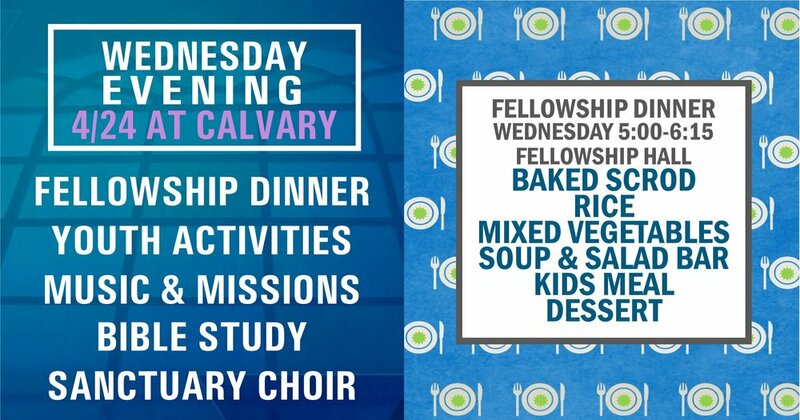 Join us Wednesday at Calvary for Fellowship Dinner in Fellowship Hall from 5:00-6:15. 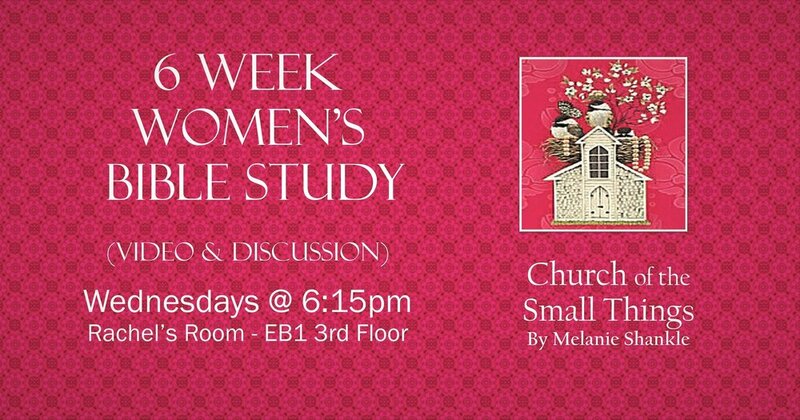 We have two Bible studies: “You’ll Get Through This” led by Carol Davis & Carrie Beth Tonks and the women’s Bible study “Church of the Small Things” in Rachel’s Room (no book or sign up needed). Join us for a special Holy Week activity: Story Trees for grades 1 - 5 in EB2, Room 202. No RA’s or GA’s on Wednesday. April 2019 Build-A-Bed Work Days Are Coming! April 16, 23, 25 & 30 from 5:30 - 7:30pm are the evening pre-cut and pre-build work dates. We’re working off site at 109 W. Loudon Avenue (the old LexTran building) cutting, sanding and staining to get ready for the Saturday, May 4th Build-A-Bed delivery day. Opportunities for all ages and skill levels. 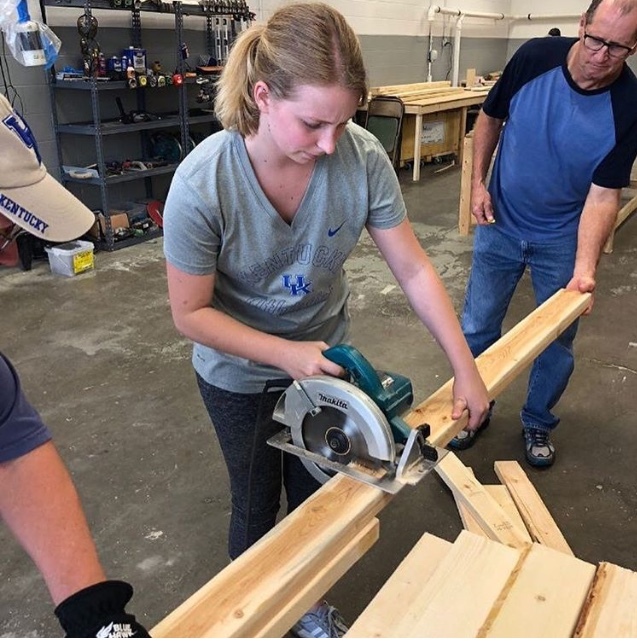 Check out WKYT's story on Calvary's March 2018 Build-A-Bed project. Contact Brian Varble via email or phone about participation or if you need information. Worship with us on Palm Sunday at 8:30, 10:45 or 11:00. Bob Browning will share the message, “Riding Into the Eye of the Storm” at the 8:30 & 11:00 services. Scripture readings this week are from Isaiah 50:4-9a and Luke 19:28-44. The 11:00 worship bulletin can be found here. Niki Hays concludes “Journey to the Empty Tomb” in our last Summit of the semester at 10:45 in the Fireside Room. College students, join us for lunch! All are invited to participate in our Holy Week and Easter activities. Whether you are one, two, three or a foursome, you are welcome to join in the fun at the HSNC Annual Golf Scramble, High Street's major fundraiser held for 2019, on Friday, June 7 at the University Club of Kentucky ( Big Blue Course ) at 4850 Leestown Road. We anticipate an outstanding day of fun, food, fellowship and prizes!!! Lunch provided by Texas Roadhouse. Convenient online registration can be found here . OR call the center at 233-1654 for reservations or information. "O Jesus I Have Promised" by Kevin Raybuck 4/10/19- click HERE to read this week’s devotion. 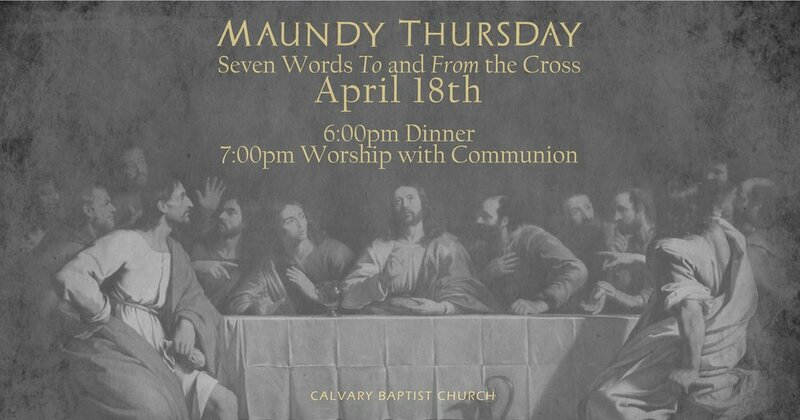 Wednesday, April 10th at Calvary: join us for Fellowship Dinner in Fellowship Hall from 5:00-6:15. We have two Bible studies: “You’ll Get Through This” led by Carol Davis & Carrie Beth Tonks and a new women’s Bible study “Church of the Small Things” in Rachel’s Room (no book or sign up needed). 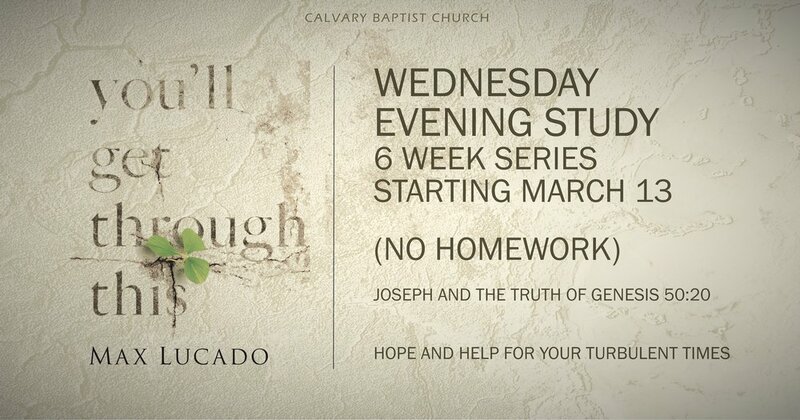 Join us Wednesday evening at 6:15pm as we continue the “You’ll Get Through This” Bible study by Max Lucado. Led by Carrie Beth Tonks and Carol Davis in the Fireside Room, this study explores Joseph and the truth of Genesis 50:20 and offers “hope and help for your turbulent times.” No homework is required for the study. Join us Wednesday, April 10th! No book or sign up needed. Melanie Shankle, New York Times bestselling author and writer at The Big Mama Blog , tackles these questions head on in her fourth book, Church of the Small Things. Easygoing and relatable, she speaks directly to the heart of women of all ages who are longing to find significance and meaning in the normal, sometimes mundane world of driving carpool to soccer practice, attending class on their college campus, cooking meals for their family, or taking care of a sick loved one. *No need to get the book or sign up for this study. Contact Jenny Carman or Becky Wills if you have questions. Check out video link below to learn more about this Bible study. Childcare (birth — age 4) is available for the 8:30am & 11:00am services. For questions re: childcare, email Children’s Minister, Carrie Beth Tonks. Worship with us at 8:30, 10:45 or 11:00 on the fifth Sunday of Lent. Bob Browning will share the sermon, “Trial and Error” at the 8:30 & 11:00 services. Scripture readings this week are from John 19:1-16. The 11:00 worship bulletin can be found here. Niki Hays continues the sermon series, “Journey to the Empty Tomb” in The Summit at 10:45 in the Fireside Room. College students, stay for lunch! Reminder: April 7th is the last day to order Easter Lilies for the Sanctuary. The cross, —We will take it. The bread, —We will break it. The pain, —We will bear it. The joy, —We will share it. The Gospel, —We will live it. The love, —We will give it. The light, —We will cherish it. The darkness, —God will perish it. Place your order by Sunday, April 7th. If you would like to purchase an Easter lily in memory or honor of someone for our Sanctuary on Easter morning, please use the envelopes provided in the front window wells of the Sanctuary or at the welcome desk. Orders can be placed in the offering plate on Sunday morning or delivered to the church office. The cost is $8. Save the date! LOGOS and all adults are invited to join us for a Reds game in Cincinnati on Wednesday, May 29th. The Reds play the Pirates at 12:35pm. Our seats are field level on the third base side. We plan to leave church at 10:00am and return by 6:00pm. The cost is $20 per ticket. Call the church office at 254-3491 or see Hank to reserve your spot. Hope you can join us on Sunday, May 19th for Combined Worship at 11:00am in the Sanctuary. Bring a friend! We’ve lined up some of Lexington’s best food trucks for lunch and fellowship on the green from 12:00-1:30pm. Calling all of our LOGOS folks! The LOGOS Spring Spruce Up Day is Thursday, April 11th from 11:00 - 1:00. Let’s get together and spruce up the church grounds for Easter. Please email tyanna.white@gmail.com if you can join us. "Turn Your Eyes Upon Jesus" by Dalen Jackson 4/3/19- click HERE to read this week’s devotion. Transition Team Update 4-3-19 (to be distributed in Sunday School folders on 4/7/19). To visit the Calvary Transition Information page, click here. Often congregation members are reluctant to voice their thoughts and opinions about the Church, but that is exactly what the Calvary Transition Team is asking Calvary members and attendees to do. We are ready to listen as you describe your current experiences at Calvary and give us your ideas for the future, especially as we begin to seek a new Senior Pastor. The Calvary Transition Team is providing two opportunities for you to voice your opinions and desires as we map out the future of Calvary. The Congregational Assessment Tool (The CAT) and Calvary Listening Sessions, will allow us to collect and understand the range of views that exist at Calvary Baptist Church and the possibilities, willingness, capacity, and energy for moving our ministry into the future. We value your opinion and look forward to your participation in both events.